Earlier this year, a young mother drove her small Subaru from the larger city down below, through the canyon and up the mountain to the little town where I work. She parked her car in a dirt lot and climbed out into a night that was cold and dark. The spring thaw had come astoundingly early, sending the snow from the mountainsides melting into the creeks and lakes, swelling them to unusually high levels, but the nights were still freezing. The mother sat at edge of the creek for some time. Then she filled her pockets with the heavy river rocks that line the creek bed and banks, and waded into the icy water. Fed by the melting glaciers of the Continental Divide and rushing toward the reservoir 100 yards downstream, the creek water was cold enough to induce hypothermia in a submerged body within a minute. The rocks did their job, and the young woman was dragged down, but not before she’d had a change of heart. Clawing desperately at the steep embankment, she struggled to pull herself from the rushing water. But ultimately she succumbed. And in the early light of dawn, her body was discovered nearby, facedown in the water, by hikers who alerted town officials. When the police chief informed my office later that morning, we all stood and stared at each other. We are a very small group, working in a very small town, and no tragedy passes unnoticed. This was particularly painful to absorb: a young mother in her twenties, going through a divorce, leaving two small children behind in her death, so desperately sad that she chose a terrifying and permanent solution to her pain. Perhaps the next day, perhaps the day after, a young man appeared at the site along the creek where the mother’s body had been recovered. He sat on the shore, in the bitter cold, and cried. Then he came back the next day, and the next, and the next after that. Until we all in town came to expect his daily vigil. Sometimes he was alone, other times he was with his parents or just his father. Occasionally a friend accompanied him. His grief was public and overwhelming. Residents reported that he often seemed to sit there all day long, crying. The police were dispatched to help. They determined that the young man was her estranged husband, father to her children, grieving a loss he could neither understand nor accept. As the days passed, the young man continued his vigil, but also brought with him his wading boots. 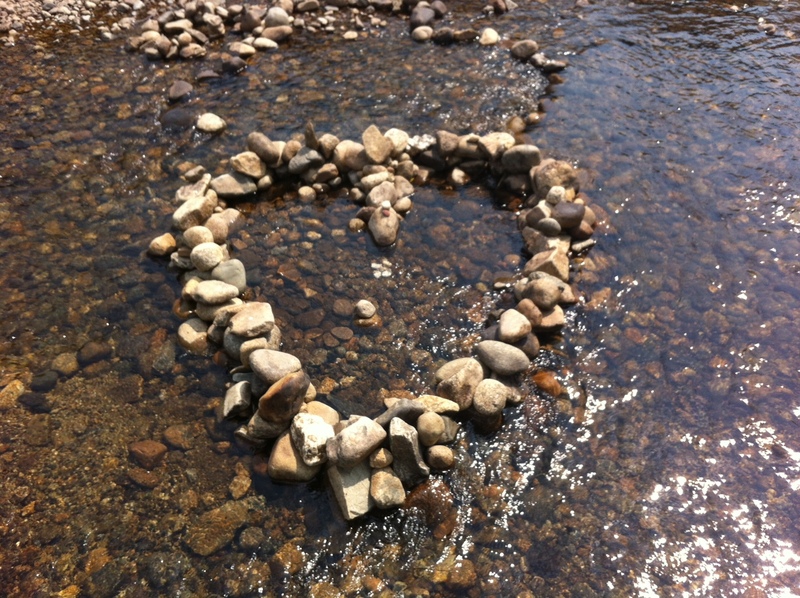 Despite the chill, he waded into the creek and created a large heart — approximately 5′ tall x 4′ wide — in the creekbed where his wife’s body had last rested, using the same kind of stones that had sealed her fate. He stacked the stones five or six high in order that they be seen above the top of the water. The task and its completion seemed to offer him some solace, and his grief resolved itself into a quiet sadness. But still he came. In the weeks that followed, a small makeshift memorial grew on the edge of the creek, with a cross, laminated letters, photos, and personal touches. Some locals added to it, others merely stopped by to offer a prayer or meditation in front of the heart of stones memorial. 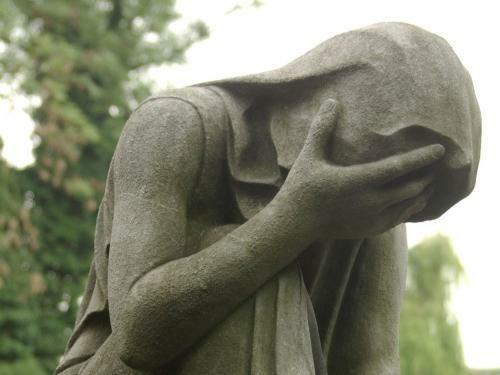 A few residents complained to me that the memorial was “in poor taste” or “unseemly” or that it “made people uncomfortable.” I listened to their complaints, then told the police chief and town manager that I did not plan to remove the memorial. Death makes people uncomfortable, for sure, but I’m not sure how making that discomfort go away is my responsibility. So, on my order, the memorial stands. I have proposed a memorial policy that will allow the family to install a commemorative bench on the site. I visited it today, for the first time, to document in photographs its existence for town records. We are now in the waning days of summer in the mountains, with sunny, warm days surrendering to chilly nights. The creek is at nearly its lowest ebb, and the heart of stones stands in strong relief to the shallow waters around it. While I was standing there, a young man turned the corner from the parking lot and approached me, smiling tentatively. I could tell by his attire that he had come a long ways to reach this spot. I stepped aside and he walked to the edge of the creek, where he squatted. His lips moved silently, as if in prayer, as he gazed at the heart of stones. I turned away, offering him some privacy. Then he stood, and I turned around. He smiled at me, and his somber eyes said thank you. He walked away and I was left alone again. I did not know this woman, nor did I know anyone who knew her. I don’t think I ever saw her husband or his family or their friends. But her death affected me this spring. It reminded me how much each life — and sometimes its end — touches so many people. How can we possibly fully appreciate the ripple effect of our choices? How do those choices permanently alter the direction of someone else’s life? It’s impossible to know, isn’t it? Everytime this spring that someone came into town hall to tell me that the man and his family were still there, I wondered about him. Why did he keep coming? Had he still loved her so much? Was his grief based on regret… remorse… guilt? What story had they shared? What will he tell his two small daughters? And what of that young mother, who made a choice she could not repeal — From wherever she was, could she see the pain her death had caused? Was her soul at peace or was it anguished? Had she had any idea how many people loved her — those ones who traveled so far to create a personal monument on a creekbed in a strange town? What does she think of the beautifully poetic memorial crafted in her honor on the site of her last breath? And what will become of her memory when, next year at the thaw, the force of the creek scatters her stone heart? The answers to those questions don’t really matter, but they are the things I pondered occasionally as the winter gave way to spring and then spring to summer here in the Rocky Mountains. I hope that her family finds peace soon, and that her soul does likewise. I will not likely forget her anytime soon, this young woman I never met. I wish so much that she had made different choices that cold March night, but I understand the world is unfolding around me just as it should, and that my lack of understanding does not make that any less true. And I hope that someday, when I die in my comfy bed of natural causes as a very elderly woman, someone who loves me builds me a heart of stones in a beautiful creek somewhere. I began this post multiple times over the last couple of months. The most progress I made on it prior to this weekend was a late night writing session following three vodka tonics, which sufficiently braced me to put letters to screen about a subject I find particularly painful and shameful. I know this post is lengthy, but I believe this issue is deserving of the time and space, so I hope you’ll bear with me. Much of this year has found me facing a daily struggle within myself. I was unable to write. Unable to play my guitar. Unable to enjoy many of the things that I used to enjoy. Because I was severely depressed. Those of you who have experienced depression are already nodding along sympathetically. You know the heaviness of it, the hopelessness of it, the monotony of it. You know how it robs you of any optimism or happiness. You know how it makes you irritable, critical, and jealous of the good fortune of others. You know the tears that appear out of nowhere and the endless sense of grinding through day after day. Those of you who have not been intimately acquainted with this particular demon are likely wondering why I couldn’t just snap out of it — go do something fun! Go dancing or to yoga or on a date! Watch a bunch of funny movies, take a bubble bath, bake some banana bread! But that’s the problem, and that’s why I decided to finally write this. In the hope that someone would find an understanding they hadn’t had before… and that someone who might be suffering would realize they are not alone in their silent pain. Let’s be very clear: Depression is not sadness. Oh no. I wish that it were. Sadness is painful and acute and sharp. It is felt and experienced and then overcome. It can be addressed with fun times and laughter with friends. It can be overcome with sunshine and delicious food and lots of hugs. Sadness is usually the result of something happening: a break-up, a death, a terrible day at work. It can be cognitively processed and massaged away with good feelings and good times. Sometimes it lasts moments, other times weeks, occasionally even months. But it has a quality that tells you that it’s temporary. And, more than anything, sadness makes sense. Depression is not sadness. It is dull and slow and heavy. It feels like it will never go away; indeed, hopelessness is one of the keystones of depression. Being depressed, even if you’re “functional” as I have always been, is like slogging through quicksand. All day, every day. Merely going about the most basic functions of a day until it’s time to sleep like the dead for as many hours as possible leaves a depressed person physically and emotionally exhausted. The body feels achy and stiff and sore; the brain fuzzy and distracted; the soul empty and dead. Depression is like an emotional cancer — it eats the very parts of you that could best defeat it. There is no energy to do the things that might help you feel better. And like an anorexic who looks in the mirror and truly sees a fat person, clinically depressed people are fundamentally unable to envision a better time, a time when the depression has lifted. The underlying, cold fear is that life will always be this way, that you will succumb to the depression and dissipate over time, until you are a lonely, isolated shell of your former self. I am well-acquainted with depression. I first experienced depression as a teenager. Like many young women, the onset of puberty ushered in an unsteady emotional time, and my life circumstances during my teens and early 20’s worsened the depressive episodes. But they were still relatively short-lived. The birth of my second daughter was followed by a vicious case of postpartum depression that necessitated, for the first time, the use of medication in order to defeat my demons. But worst of all was an episode toward the end of my marriage that was so long and dark that my doctor actually evaluated me for hospitalization. Yes, depression is a familiar enemy. I can see it coming… creeping up on me like a figure emerging from the shadows. Over the years, I have come to recognize the cocktail that is most dangerous for me: one difficult, sad event (a break-up, a death, some enormous, temporary stressor) that I could otherwise manage as well as anyone else, coupled with an underlying emotional struggle of some magnitude that is already sapping my energy (ongoing difficulties at work, trouble in a relationship, health issues, etc). The one-two punch, so to speak, knocks me far enough off-balance that the nasty ephemeral figure of depression is able to get a firm grasp on me. With my depleted emotional reserves, I cannot fight him off, and I succumb. And I can literally feel vertigo as I tumble into the black hole of the depression. I have been more fortunate than many people, however, in that my depression has never been debilitating. I have never not been able to get out of bed, or go to work, or care for my children. I have never lost friends, or boyfriends, or jobs because of my depression. I have always managed to function well enough to conceal — oftentimes from even my closest friends — the depths of my despair. And I have also been fortunate to have had the kinds of friends and family who have propped me up and encouraged me and held me when I cried senselessly. I suspect that those who lose their battle with depression to suicide feel so isolated by the disease infecting their soul that their friends and family cannot break through to reach them. I have never gone that far into the dark, and I pray that I never will. Due to its classification as a mental illness, depression still carries some stigma, and I will admit that I am even guilty of stigmatizing myself. When I get depressed, I am ashamed of myself. Ashamed that I didn’t see the monster coming, didn’t fight off his grasping, icy hands as they dragged me down. Terrified that my friends and family will cease to regard me as a strong, accomplished woman. But I also wholeheartedly believe that depression IS a mental illness, although perhaps a temporary one for most people. It is irrational and sometimes disabling. It alters your sense of what’s real and true and possible, and, if left untreated over time, it can destroy the best and brightest parts of even the most amazing person. My exit from a depressive episode is typically prompted by some triggering event that serves as an emotional course adjustment. Such an event, along with the help of therapy, medication, friends, and some proactive personal choices, enabled me to emerge from the black pit I was in for so much of this year. But each visit to that place takes its toll. I am tired and a little unsteady and still recovering, as you might be if recovering from a lengthy and debilitating physical illness. But I am also peaceful and secure and genuinely feeling hopeful and empowered again. Many mental illnesses have an upside (yes, you read that correctly). Some of history’s greatest minds and artists likely suffered from bi-polar disorder and, during their manic phases, created some of the most original work and art known to man. Similarly, I have discovered the silver lining of my depressive episodes: I emerge from them with increased clarity. It is like someone has wiped clean my third eye, allowing me to see perfectly clearly the people and situations before me so that I can chart a considered and thoughtful path based on rational reasoning and authentic intuition. I am not sure that I can say that the benefit of this clarity is worth the suffering of depression, nor do I have any idea if others experience this after a depressive episode. But I do, and I am grateful for it. I fully recognize that I am not forced to write any of this. I get to choose what of my life remains private and which persona I chose to share or create for my blog readers. And certainly, for those who do not know me personally, it could be fun to be the blogger with the answers — the easy, breezy, confident woman who saunters through life and work and relationships with nary a misstep or hesitation. But that is not me. And I don’t actually have any desire to be that woman because I suspect that that woman would neither relate to nor provide any real value to the wonderful souls who read the words I share. Easy and perfect are not useful or instructive; it is only through our shared struggles and accomplishments that we experience our true humanity. If you are depressed right now, you are not alone. Your current situation will not always be so. Life will change, eventually and with certainty. Hopelessness is a symptom of the disease, not a part of who you are. Just do your best each day, in whatever small way feels like a victory, and be gentle with your struggling soul. Seek help — tell friends, call your doctor, call a therapist. Don’t allow the isolation to swallow you whole. Don’t allow the depression to rob you of your life. You are beautiful and you are loved and you have a future in front of you that you cannot imagine right now. Please try your best to remember that the sun will come out again. I promise it will. It always does, if only we hang on long enough.